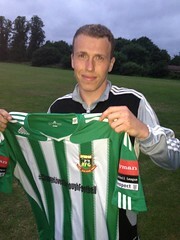 The third new face to join the club this summer is 28 year old Chris Seeby, who joins from St Albans City. Equally at home in defence or midfield, Chris began his career in the youth team at St Albans, and worked his way through the ranks, eventually playing in the Conference Premier with the club. He later had spells at Northwood and Slough Town, before returning to St Albans in November 2011, where he went on to take his total of appearances to well over 200, scoring 10 goals in the process. 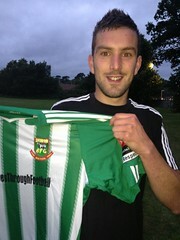 As with Tony and George, we warmly welcome Chris to the club, and are sure he'll enjoy his time with us as well. 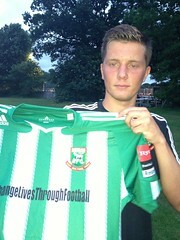 Another new face joining the club is experienced midfielder Tony Taggart, who has joined from Hampton & Richmond Borough. The 31 year old began his career with Farnborough Town, since when he has also played for Barnet, Weymouth, Eastleigh, Newport County, Sutton United and Havant & Waterlooville, spending much of his career in Conference South. We are delighted to welcome Tony to the club, and hope that he enjoys his time with us. We are pleased to announce that George McCluskey, has returned to the club on a permanent basis from Barnet. George, who is a 19 year old defender, was released by Barnet a few weeks ago. Supporters will remember his influence on the FA Cup run last season during his loan spell in which he made 8 appearances. He also had a spell on loan at Hayes & Yeading United. George rejoins his older brother Carl, and we hope that he enjoys his second spell with us. Ten of last season's squad have signed Ryman League forms for the new season, with more likely to follow over the next few days. The first team returned to training on Thursday evening, and also trained earlier today. The players registered so far are Elliott Brathwaite, Scott Cousins, Dave Diedhiou, Berkley Laurencin, Casey Maclaren, Kevin Maclaren, Carl McCluskey, Max McCann, Lee O'Leary and Sean Thomas. Please note that the squad list on the website only shows those players who have signed forms for the new season. Just because other names don't appear, it doesn't mean they have left the club. As and when more players sign up, the news will appear first here on Greensnet. We have opportunities available for anyone interested in becoming a manager in our expanding youth section. If anyone is interested, please email the club on admin@hendonfc.net and we will get back to you as quickly as possible. Gary McCann has confirmed this evening that Howard Hall has left the club to sign for St Albans City. Howard, who joins former team mates Ryan Wharton and Greg Ngoyi at Clarence Park, joined the club last summer, and made 42 appearances, scoring 3 goals, and won the most improved player award. The good news is that Gary is not currently expecting any other departures from the squad that finished the season with us, and they will begin pre-season training on Thursday evening. We wish Howard every success at his new club, and thank him for his efforts over the past twelve months. The draw for the Middlesex Senior Cup was made yesterday, and in a repeat of last season we have been drawn away to North Greenford United in the second round. Both clubs have received a bye through the first round, and the tie is due to be played on Tuesday 3rd December, kicking off at 7.45pm. The next draws expected are the FA Cup and FA Trophy draws which are due to be released on Friday 5th July, whilst the league fixtures are expected to be announced on Monday 15th July. We are delighted to announce that an updated edition of the popular Hendon FC history book is now available for Kindle, priced at £4.00. The book, written by Peter Lush and David Ballheimer, has been updated to the end of the 2012-13 season, and has an improved statistics section than the 2008 print edition. The book can be found by searching for Hendon FC on Amazon, or buy clicking the link below. The friendly against Barnet on 23rd July will now kick off at the slightly earlier time of 7:30pm. We are pleased to announce admission price details for our two home friendlies coming up later this summer. Entrance prices for the game against Chelsea U21s on 6th August will be Adults £10, Concessions (senior citizens over 60 and students) £5, and under 16s free. Prices for the game against Barnet on 23rd July will be Adults £5, Concessions (senior citzens over 60 and students) £2.50 and under 16s free. Please note that the offer for season ticket holders of other clubs does not apply for pre-season friendlies, or indeed for cup matches. Tickets for both games will be sold on the day. The Ryman League have confirmed the dates for 2013-14, and as previously reported, the season will commence on Saturday 10th August. The league season will end on Saturday 26th April, with the play-off semi-finals scheduled for the week beginning 28th April. The three play-off finals will be played over the weekend of the 3rd, 4th and 5th May. The fixtures for the new season are scheduled to be released during the week beginning 15th July, whilst the FA Cup and FA Trophy draws are due to be released on Friday 5th July. Edgar Davids will be bringing a full strength Barnet side to Hendon on Tuesday 23rd July for a pre-season friendly. This, together with the previously announced home game against Chelsea U21s, means that we have two quality home friendlies to look forward to. The Barnet game will be played at our new Earlsmead home, and will kick off at 7.45pm. Admission details for the two home friendlies will be announced very soon. The Snowball draws for January to April were conducted at the recent Awards Night, with over £1700 being given away in prizes. The results are as follows. January : 1st prize (£291.00) - number 212. 2nd prize (£145.50) - number 188. February : 1st prize (£291.00) - number 127. 2nd prize (£145.50) - number 169. March : 1st prize (£297.00) - number 152. 2nd prize (£148.50) - number 31. April : 1st prize (£288.00) - number 79. 2nd prize (£144.00) - number 126. All winners will be contacted shortly if they haven't already heard from the supporters trust. The next draws will be made at the AGM, the date for which will be announced as soon as it has been confirmed.